Miriam has loved her organ class this semester. She loves her teacher, her TAs, her classmates. 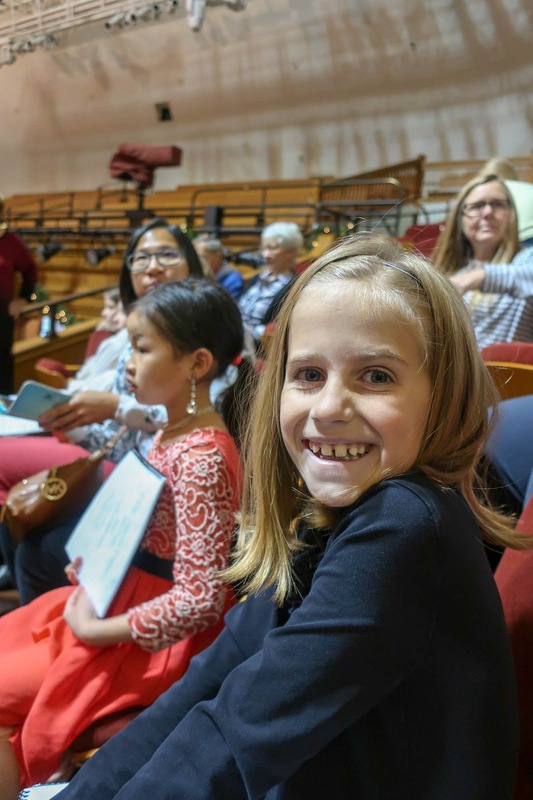 She loves practicing, she loves performing, and she's loved their field trips. It's been a wonderful experience for her. On Saturday we schlepped all the kids (and my mom) up to Salt Lake for Miriam's class field trip to the tabernacle. We were asked that no children under the age of eight come, which rather ruined our plans. 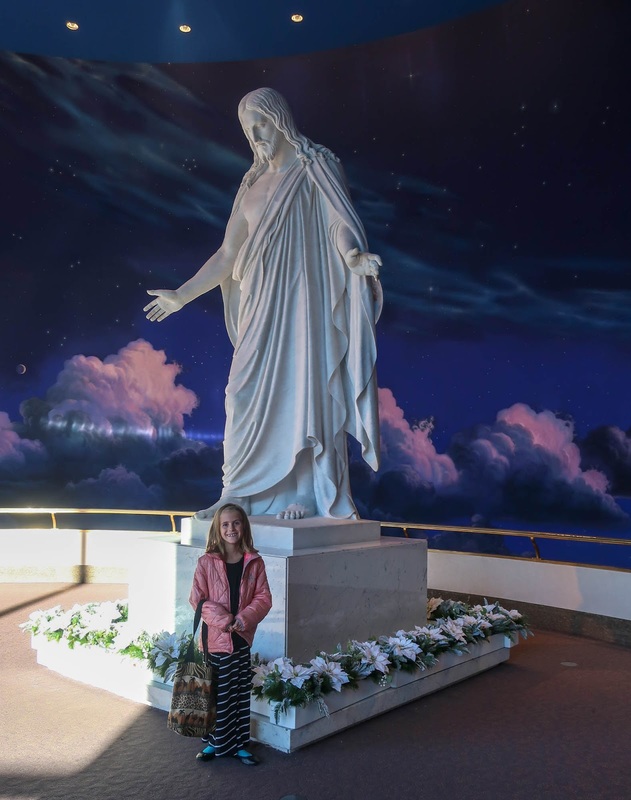 So we decided that the little kids would wander around Temple Square with Daddy (looking at the nativities, checking out the visitors centers, and so forth) and my mom and I would accompany Miriam (Rachel stayed home with Grandpa so that she would be sure to make it to a birthday party she'd been invited to). 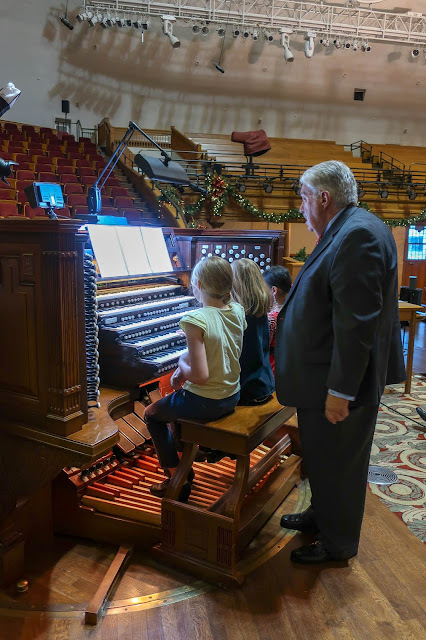 I didn't understand why Andrew couldn't bring the kids in to listen to their sister play since the tabernacle is typically open to visitors, but we were told no kids so we listened. As it turns out, they totally could have come through the main doors to hear her play; we got to go up through the back entrance into the choir seats (which I'm assuming is particularly where they didn't want children). It ended up not mattering because there wasn't any way we were going to bring the kids to a concert Saturday morning, anyway. We woke them up around 6:30 so we could get ready to go. Zoë was out of sorts because she's not used to waking up quite that early. It was still dark out. That meant it was still night. What were we doing dragging her out of bed?! She yelled about her clothes. She yelled about breakfast. She yelled about getting buckled up in the car. Eventually she settled down, but she was still a grumpy little tyrant. "Daddy, don't drive too fast!" she ordered from her car seat throne. "Can't Mommy drive? I want Mommy to drive. Mommy never drives too fast." "We're on the freeway, baby," Andrew told her. "I have to go fast." "Can you not go so wobbly then? You're driving fast and wobbly and it's making my tummy hurt." She always asks us to drive slow and straight (or else her tummy hurts) so I didn't think too much of this. We stopped to pick up my mom, who nimbly climbed into the way back of the van (which takes quite a lot of skill for a full grown adult to accomplish) and continued on our way. "Are we there yet?" Zoë asked. "Will we be there soon? How many minutes until we get there? Can you drive slower, Daddy? I don't feel so good. My tummy hurts. Mom, Mom, Mom. My tummy hurts a lot!" I let her natter on for a few more minutes (because she always whines in the car) before I started to take her pleadings seriously. "Are you going to throw up?" I asked her. "YES!" she said, now quite panicked. I grabbed an empty grocery bag from the floor, snapped it open, and handed it to her. "Throw up in here if you really need to," I said and the next thing I knew she was rubbing the bag all over her face. "No, don't do that!" I said. "We don't put plastic bags over our...oh." She was throwing up on the bag (not into it) and was rather frustratedly smearing it all over herself. Perhaps the grocery-bag-as-barf-bag was not the best idea (but it was the only one I had at the time). I climbed back to her (while Andrew was still careening down the highway) and started swabbing her off with baby wipes, gagging every few minutes because I'm really not very good with vomit. "And turn on some cold air!" I ordered. "It's so hot back here!" Once I had her about as clean as we were going to get her, while trapped in a minivan with limited supplies, I opened the floor storage compartment and pulled out the extra seat cushion and got the middle seat assembled so that I could sit beside her, ready to hold another bag we'd found in front of her, should she decide she needed to throw up again. Fortunately, she didn't. But there was no way Andrew was taking the kids to Temple Square like that so he dropped of Miriam, my mom, and me, and took the kids (Alexander, Benjamin and Zoë) to a gas station to get Zoë tidied up. And then he took them to Costco where I figured he was going to get a new outfit for her to wear because she had vomit all over her sweater and pants (and socks and shoes) and I said, "You can find a new outfit for her if you want." But he took that to mean there was a change of clothes stashed in the van. All he found was an extra sweater for her (by now you're probably thinking, what with all these plastic bags and extra sweaters (not to mention the blanket that was on the floor that Zoë threw up on (and thank goodness for that because washing a blanket is much easier than scrubbing a car mat)) we kept finding in our van, that it must have been quite some time since we cleaned out our van; you would be correct in thinking that). So he put her in that extra sweater and just let her wear her vomit encrusted pants around all day. Fun. I totally thought he would just buy the girl some pants. Anyway, we suddenly became those people who took a potentially sick child grocery shopping. But we absolutely weren't going to have Miriam skip her tabernacle field trip due to a little vomit, so Andrew was effectively trapped in Salt Lake with the little kids and it's cold outside so he wasn't about to just sit in the van with them. So grocery shopping it was. At least this way he could contain Zoë to a cart. I sort of pity the family that had to use the cart after them, but at the same time—good news!—she was just car sick! Hallelujah! We've been nervously watching her for any sign of actual illness, but she only threw up the one time and then was chipper as could be for the rest of the day. She didn't get a fever. She ate lunch and dinner just fine and she passed the 24-hour mark by the time we left for church in the morning so she came along with us. I think the combination of (a) waking up earlier than she was used to, (b) having the heat too high in the back, and (c) going on a long(ish) car ride (when she tends to get a little motion sick under the best of circumstances) tipped her scales just enough to bring up her breakfast. I'm so happy about this. The first thing I wanted to do when we got to Temple Square was visit a restroom so I could wash my hands with soap and water. I'd wiped them off with baby wipes but...I still felt icky. Unfortunately, it was only 8:30 or so, which meant none of the visistors centers had opened yet. Fortunately, the bathrooms behind the assembly hall were! So we all went in to use the facilities and decided that we'd just wait around inside for a few minutes before heading to the tabernacle because it was so cold out! But then we heard a noise coming from the other half of the restroom, so I went to investigate and we found that we were not the only ones taking refuge from the cold. There was a homeless person in one of the stalls (with their cart and everything) so we made our exit. By then a few of Miriam's friends had started trickling onto the plaza, so we went to wait with them. Or near them. We weren't really with them. "We probably look a bit standoffish," my mom said. "I feel a bit standoffish," I confessed, to which she responded, "Grief is weird." It is weird, but life moves on. Miriam was bouncing with excitement, so my mom suggested she go say hello to her friends. She skipped off happily and eventually we all made our way into the tabernacle choir seats, which was pretty cool. Miriam was called on first and so became the ice breaker of the group, approaching this gigantic organ (with five manuals) and setting up her music like it was perfectly normal. She played There is a Green Hill Far Away, which she's played in public a few times before (during prelude one Sunday and again at Grandma's memorial service). The man in charge of the organ was a bit of a hoverer and even went so far as to move her hands in the middle of her piece because when she went up to the third manual she accidentally also went up an octave (but how was she supposed to expect that—the organs in her classroom and at the church only have two manuals so a third was something new). That threw her off and she had to start the second verse over (and he didn't make such a forceful correction to any other student so perhaps he realized he'd overstepped his bounds a little (playing a verse an octave higher isn't a terrible crime, after all)). 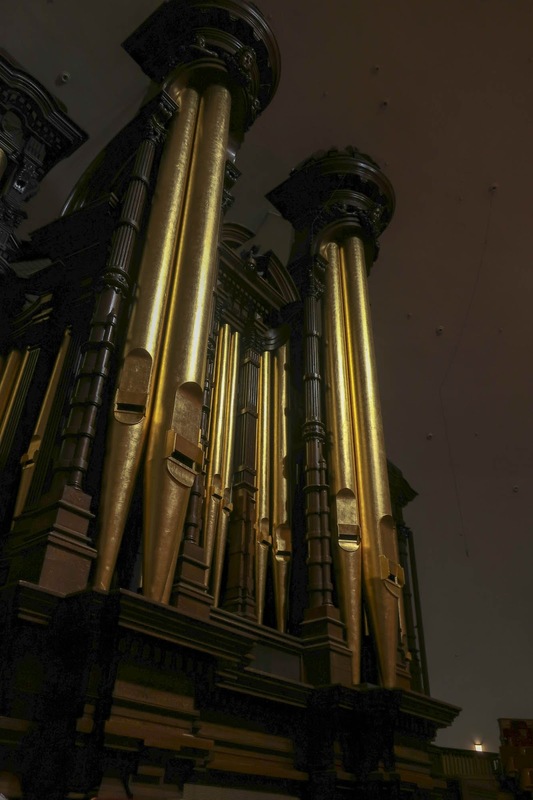 And then she decided, at the last minute, while she was playing, in the tabernacle, in front of everybody, that she'd tack on a fancy ending that she hadn't ever practiced before. She just does stuff like that. I don't know how. She can transpose music as well. Like, if she learns it in one key and you ask her to play it in another key she just...can. I don't know how she does it but, she does (and I think it's pretty cool). She was also part of the grand finale—a trio of Jingle Bells. When she first told me that she was going to be part of a trio I thought to myself, "How?! They can't really just wheel an extra organ into a concert hall..."
But then I realized that I am a ditz. I have seen many, many organ duets in my lifetime (mostly on screen at general conference) and I know that two people can play on the same organ. Organs have so much going on—the pedals and multiple manual keyboards! And here they are, all happy that it's over. Playing an instrument this powerful can be rather disorienting—and surely it doesn't help to have the grown ups all flipping switches and pulling levers while you're playing, completely changing the sound you're producing! One of the girls played We Three Kings and asked if she could play it forte. "Goodness, no!" their teacher Nora said. "I love you, but no." When the student begged further Nora said, "Alright, perhaps on the chorus we'll ramp things up for you." So this sweet little girl sat down to play and when she got to the chorus, one of the men flipped a switch that literally pulled out all the stops. The young organist played the first chord of the chorus and was about blown off of the bench! It was so loud! The look of shock on her face was priceless and she fumbled through the rest of the chorus looking a bit shaken. It was rather hilarious; I wish I had been filming then! 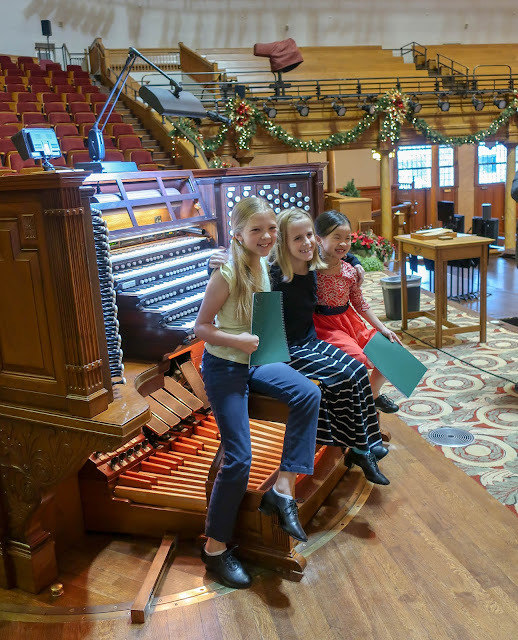 All the kids were such good sports, allowing so many people to correct them and fiddle with the organ while they were playing and for doing such a brave—but amazingly awesome—thing in the first place. How many nine-year-olds can say they've played the organ at the tabernacle?! Andrew had just finished shopping when we finished with our little recital, so he left Costco (the world's biggest!) to pick us up right away. We went to the visitor's center to see the Christus and then walked to our designated meeting spot where Andrew soon pulled up. On the way home we introduced my mom to IKEA. She had never been and couldn't see what all the fuss was about. She hates shopping (which I understand because I, too, dislike shopping), but IKEA is a different sort of shopping experience. It's...fun! Their showroom is like walking through a magazine. You don't feel pressured to buy, necessarily (though we did get a few things more than what we'd come for because they have so many fun things); you are free to simply peruse if that's all you want to do. Anyway, my mom liked it and even said she might go back! It was a good morning, even if we had to endure the smell of vomit the whole car ride home.